Why do people keep saying HTC copied Nokia's Lumia design? I don't get it. The Lumia was unveiled on Sep 5th. The HTC 8X and 8S were released less than 3 weeks later. Anybody that knows anything about product design can tell you that you can't design and show off a new phone in 3 weeks. The only reason I can think of for why these phones look somewhat similar is because MS gave some inputs on colors and some general guidelines for design that gels well with Windows Phone 8 OS. What your are seeing is two design teams in different countries thinking alike and coming up with products that fit the design constraints that were imposed on them. To draw on a Formula 1 racing analogy, 10 different teams from different companies in different countries show up each year at the first race and about 99% of every car looks exactly like a rival team's car. It is quite amazing actually when you see how closely the cars designed by two teams in two different countries end up looking so alike each other. This is because they are all working under the same design rules and specifications. Engineers anywhere you go, think alike. Doesn't matter if they are Italian, British or French. When working under similar constraints, they usually come up with solutions that are very similar. I am thinking this is what happened with HTC, Nokia and MS.
Last edited by saintforlife; 09-22-2012 at 04:23 AM. Dude, 920 and 820 are not NOKIA's first unibody colored Lumias, They started back in April 2010 with unibody and colored N8, then in June 2011 with poly-carbonated N9, Lumia 800 with colored shells in October 2011 and then January 2012, Lumia 900. So it's clear that NOKIA was the first and only one with these designs for about 3 years. HTC just starting now means they were inspired by NOKIA's designs. ^That's true but I don't think it necessarily means they were copying Nokia. Did you watch the HTC event? The designers talked about how HTC wanted to make a phone that matched the unique UI of WP. Which, I think they did a great job of, and were most likely pressured by Microsoft to do so as well. The people who claim that Nokia somehow invented color plastic cases are as annoying as the iFans who claim that the original Lumia design was a copy of the iPod nano. I'm not sure anyone's really making that statement on here. That's essentially the claim -- "HTC copied Nokia, look, they're multicolored!" Its not the colors that I think they copied. Wasn't the Dell Venue pro curved glass also? Just admit it's the colors. Dell Venue Pro, Palm Pre II and HP Veer had rounded glass before the first Lumias. Is the HTC 8X carved out of one block like N9,800, 900? What Mary Jo was talking about the build quality of 920 and X8 it seems like on HTC 8X it's a shell rather than how Lumia's and N9 are build. I doubt it's a coincidence that HTC suddenly has polycarbonate unibody phone with curved glass and bright colors. Though honestly, i don't care. And like said N9 did indeed start the carved poly design from Nokia back in summer 2011. Apple had curved plastic and metal iPod designs in colors prior to the Lumias, and pioneered the whole "one-piece case" thing with the aluminum MacBooks, if we want to get super-technical. 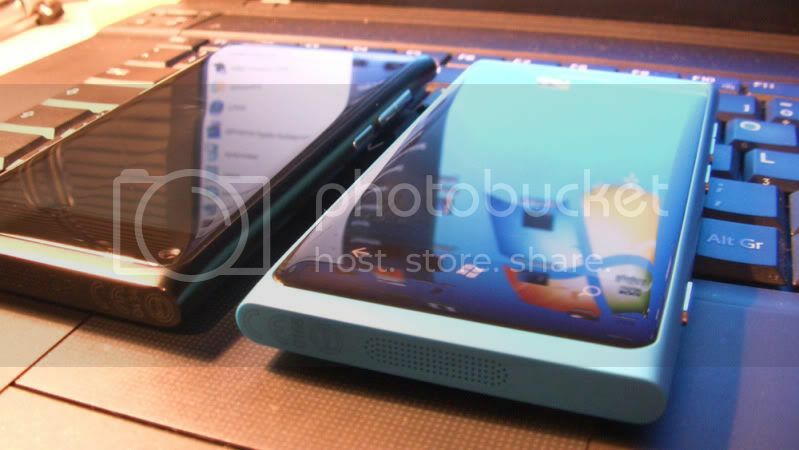 I don't think HTC copied Nokia, if that were the case then every phone since the L800 would've been designed as such. There's only so many designs you can make with a rectangle as your base. There's bound to be overlap somewhere. Really? I didn't say that. Who did? But what I do find interesting are some posters who ridiculed Nokia's color choices are now praising HTC's. Let's get real, besides Red and a possible Cyan. HTC color combinations are superior. Also deliciously Matte. Ummm no. FIA makes the rules as to the design of the cars, engines, suspensions - everything. I suspect MS is not nearly as stringent, or every WP would have the exact same processor, battery, ram size etc. Not even close to the same. I have to agree here with the HTC folks even though I'm a Nokia fan. I don't see a blatant rip off that everyone's screaming about. Do you all know that Huwaei also announced that their Windows phones will come in multiple colors too?! As for the curved glass display, both the OneS and OneX had them. eric12341 and brmiller1976 like this. And i said this before, but HTC tried to make the phone like WP8. That's therr inspiration. Even though the design started before WP with the N8, I believe Nokia kept the design for the same reason. So i just don't think Nokia was copied, and it doesn't appear Nokia feels that way, either. Isn't the point of Polycarbonate is that it doesn't lose color? My Sunglasses are like that.